Press Room Automation group put their small steps in promoting Press Automation in 1986 in an under developed Indian Market. In 1995 with wind of globalisation, need of automation increased manifold, company went as focusing in adding the range sophistication to meet end customer needs. A pit may be required for long feed lengths, stock should be a minimum one feed length Non-motorized payoff reel with air brake electric brake, or friction drag brake. 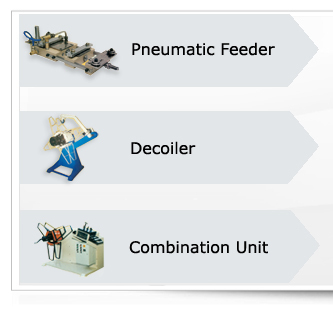 Complete press feeding solutions supplied Nationally / Internationally. Address : 4, Sachin Industrial Estate, Kolbad, Behind Pratap Cinema, Thane (W) - 400 601, Maharashtra, India.